Red, White and Beautiful for Memorial Day Weekend – Nautica Inspired! Are you ready to get decked out in your red, white and blues for Memorial Day Weekend? Is this something you do or not so much? While I’m not into hats with flags on them and red, white and blue from head to toe, I am into stylish pieces that honor our country and show off our color’s proudly. When I think of wearing red, white and blue stylishly, the very first company that comes to my mind is Nautica. As you’re about to see, they have a great selection of fashion pieces to celebrate the holiday. There’s a swimsuit I am dying over. Although most places it’s getting quite hot, the evenings can be a little breezy. For a limited time, you can purchase this online exclusive American Flag Jacket. It features a translucent, water-resistant outer layer that reveals an underlying mesh sporting a beautiful, American flag design. Do you have a party to go to that requires a little dressing up? Maybe a little boat party? This Boat Neck Stripe Dolman dress is modern, yet simple and comfortable. You can adjust the belt for a tighter or looser fit. Add a pair of bangle bracelets and sandals…and you need nothing else to make this outfit a hit. Here is the bathing suit I was talking about. Are you dying too? It features such a simple style but is a little flirty too. Those navy pleat accents are what do it for me. What’s a Memorial Day Weekend without a pair of flip flops? A complete failure. From the stripes to the anchor detail, these flip flops will add some color and style to any outfit. Picture these with white shorts and a blue top. I love, love, love the little anchor button. I do love me a good nautical style outfit! 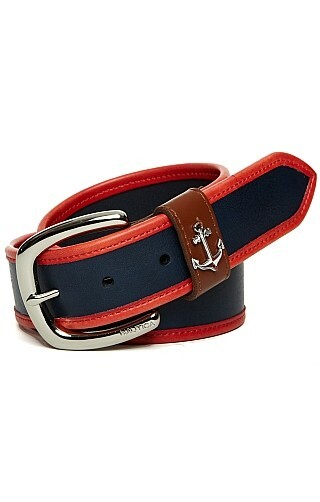 Speaking of anchors and nautical goodness…check out this belt. It has just the right amount of nautical flair. I have a pair of white shorts that need this belt. Seriously, they need it. 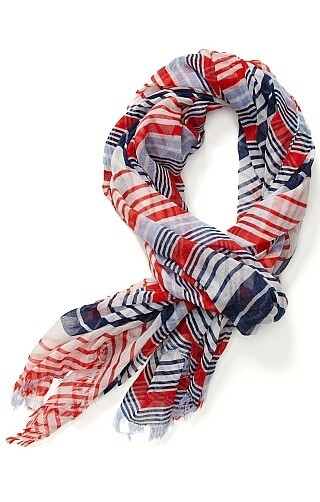 Dress up your Memorial Day Weekend outfit with a lightweight scarf. This scarf features the Nautica signature stripe, which I just so happen to be a big fan of. Kick up your jean shorts and tee-shirt with one of these babies. Do you have any big Memorial Day Weekend plans? More importantly, do you know what you’re wearing for those big plans?! I hope these key pieces from Nautica gave you some fabulous outfit ideas.